EVANSTON, Ill.—Just as a journey of 1,000 miles begins with a single step, the deformations and fractures that cause catastrophic failure in materials begin with a few molecules torn out of place. This in turn leads to a cascade of damage at increasingly larger scales, culminating in total mechanical breakdown. That process is of urgent interest to researchers studying how to build high-strength composite materials for critical components ranging from airplane wings and wind-turbine blades to artificial knee joints. 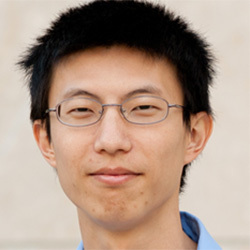 Northwestern Engineering’s Muzhou Wang worked with scientists from the National Institute of Standards and Technology (NIST) to devise a way to observe the effects of strain at the single-molecule level by measuring how an applied force changes the three-dimensional alignment of molecules in the material. The research was published in the journal Materials Horizons. The technique uses single-molecule super-resolution optical microscopy, which can resolve objects in the range of 20 nanometers (billionths of a meter) – about one-tenth the size of what can be seen at the sharpest focus with a conventional optical microscope – to examine a polymer doped with fluorescent molecules that emit light of one wavelength when they are illuminated with light of another wavelength. An image of the emitted light reveals not only a molecule’s location, but also its orientation horizontally and vertically. The study builds on previously published work from Wang and his research group, in which they designed a fluorescent molecule that can be used to watch nanostructures develop in real time. Prior to this experiment, the scientists used a mathematical model that predicted how light would look when emitted by molecules in different 3D alignments. When they illuminated the fluorescent molecules and made images of the emitted light, the results matched the model. After about 10,000 cycles of illumination, a telltale pattern emerged showing the extent of deformation. “It’s sort of like a pointillist painting, where individual dots build up to form a shape,” Liddle said. In addition to the technique’s clear relevance to the design of essential composite materials, there might also be applications in medicine. In addition, the scientists hope to improve resolution by a factor of about five — allowing them to image areas as small as a few nanometers. This could be accomplished by increasing the brightness of the fluorescent molecules, perhaps by reducing their exposure to oxygen, which shuts off fluorescence. “It still amazes me that I can look at this little bright spot in a microscope and know within 5 or 10 nanometers where it is and also know, within a few degrees, in which direction it’s pointing,” Liddle said. In addition to NIST scientists, researchers at the University of Maryland NanoCenter contributed to the experiment and journal article. Read the full article at the McCormick School of Engineering website. The International Institute for Nanotechnology at Northwestern University is an umbrella organization that represents and unites more than $1 billion in nanotechnology research, education and supporting infrastructure.